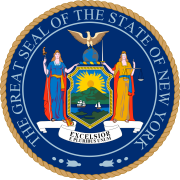 The 1918 New York gubernatorial election took place on November , 1918, to elect the Governor and Lieutenant Governor of New York, concurrently with elections to the United States Senate in other states and elections to the United States House of Representatives and various state and local elections. New York City alderman Al Smith was elected to the first of his five terms as Governor. ✪ Champion for Democracy? - Woodrow Wilson I WHO DID WHAT IN WW1? ^ "New York gubernatorial Republican primary, 1918". ^ "New York gubernatorial Democratic primary, 1918". ^ "1918 New York Gubernatorial Election Results".